Tory Coats was interviewed about his winning Accelerate pitch on Cleveland 19 News on Wednesday, March 7. He spoke with reporter Sara Goldenberg about his plans to work with teens on creating pop-up shops to transform Cleveland neighborhoods and help them become entrepreneurs. CLC President and CEO Marianne Crosley spoke about how Accelerate gives voice to individuals who have ideas for positive community change. 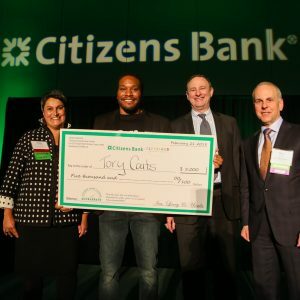 Accelerate was presented by CLC and Citizens Bank, and Tory’s pitch in the Economic and Workforce Development category was supported by Oatey Co.